We mess around with the newest iOS product from ION. Peripheral maker ION made a name for itself in the tablet world with the iCade, a $99.99 tabletop arcade cabinet for iPad that gives users the chance to play well over 100 touchscreen games with more traditional buttons, all without the need for quarters. Now the company's back with a pintsized version, appropriately called iCade Jr. We had a chance to get our hands on one at the recent GameStop Expo, and while it certainly looks cute, we don't know if the device can rival its big brother. 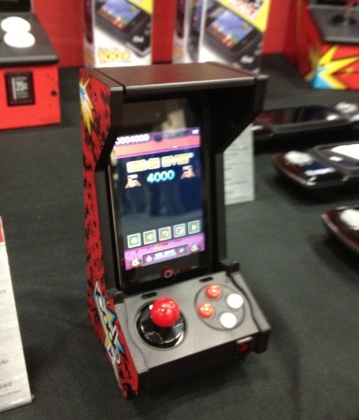 Before getting into that, it's easy to fall in love with iCade Jr., at least when it comes to aesthetics. 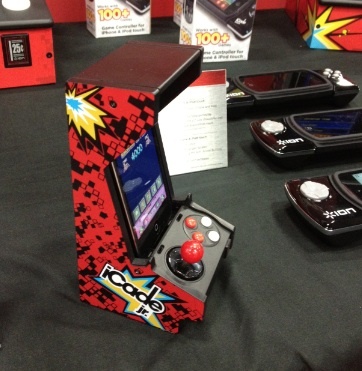 It's essentially a mini iCade designed to sync with the iPhone via Bluetooth, complete with detachable joystick (players can unscrew this to access the d-pad), four front buttons and then four rear trigger buttons. The fact that it resembles one of those classic arcade cabinets from the 80s and 90s makes iCade Jr. both a novelty and instant conversation starter. Bottom line, you'll want to display it at home and in the office. Using iCade Jr. to play video games, however, appears to be hit and miss. The fact that it's so small means it fits in the hands like a video game controller, though we found using it this way to be a bit uncomfortable, especially when it came to reaching around the back to press those aforementioned triggers. Suffice to say, resting it on a table or another flat surface is the best way to go. At least on the positive side, most retro-inspired games only make use of one to two buttons, so if anything, the triggers won't come into play. With this in mind, we think the iCade Jr. does a good job giving iPhone owners a better way to enjoy some of their favorite titles, but it remains to be seen how more complex games will work, given the awkward trigger placement. But at $49.99, it's half the price of the iCade, and if anything, gives you something to talk about with friends and coworkers. Look for it this October, with over 200 compatible games.